Powers/Abilities: Allegedly baptized in flames and granted the strength to transcend physical pain by the divine science of the elders, the Foolkiller could survive explosions or weather energy blasts unharmed. He described his hand as a "fist full of metal," perhaps meaning his hand (or maybe even his whole body) has metal in its bones. He seemed to have some degree of superhuman strength (enhanced human) and could recover rapidly from major impacts. He carried a laser pistol capable of blowing the arm off of a grown man, cauterizing the wound in the process. He also used a gauntlet with large claws. 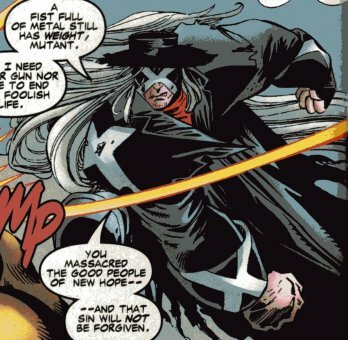 (X-Men 2099#33 (fb) - BTS) - According to Foolkiller, New Hope, Texas was "the last bastion of true Americans that still believed in God and family...Good folk free of the taint of the Godless Mega-Corporation Cabal." (X-Men 2099#33 (fb) - BTS) - New Hope's founders planted mines in the streets. (X-Men 2099#33 (fb) - BTS) - The Foolkillers were the executioners of New Hope, fundamentalist super soldiers named after a 21st century zealot. 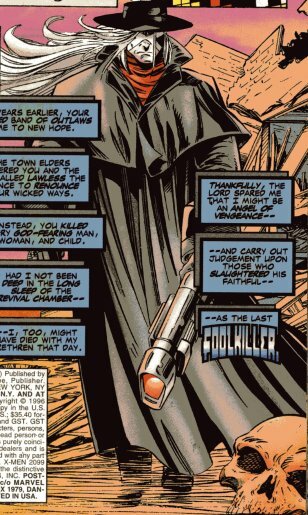 (X-Men 2099#33 (fb)) - One of the Foolkillers told Gideon that the elders had judged his parents as fools, and that if Gideon wished to remain part of the congregation he must renounce them and pull the trigger on an energy blaster to cleanse them of their sins. Gideon did so. (X-Men 2099#33 (fb) - BTS) - Gideon was chosen to become a Foolkiller because his faith was strong and unbreakable. (X-Men 2099#33 (fb) - BTS) - Gideon was placed in a subterranean genetic chamber known as the Revival Chamber, which would empower him to be a Foolkiller. (X-Men 2099#33 (fb) - BTS) <2095 - four years before the main story> - The Lawless (Auntie Maim, Broken Haiku, Junkpile, Mongrel, Reverend, Victor Ten Eagles, Xi'an Chi Xan) came to New Hope, Texas. (X-Men 2099#33 (fb)) - The Lawless ran over the street mines, after which they ambushed by the town's inquisition. The head Foolkiller made it clear that they would kill anyone who didn't fall in with their twisted faith. For two days, the Lawless were subjected to a variety of subtle and unsubtle tortures designed to convert them. Broken Haiku eventually hacked into their computers and shut off the tranquilizer feed that was keeping the Lawless sedated. (X-Men 2099#32 (fb) - BTS / X-Men 2099#33 (fb)) - They fought their way through the "handful of psychopaths called Foolkillers" and then found then rest of the town was willing to fight to the last man to stop them. The Lawless slew every man, woman, and child in town. Deep in the long sleep of the Revival Chamber, Gideon survived. (X-Men 2099#32 (fb)) - The Lawless encountered the badly injured elder Beaumont, one of those who had passed judgment on them. Beaumont told him that they would all die as fools (whether by his hand or by another's) and raised his gun, Xi'an swatted Beaumont down and kicked him before the Lawless departed. (X-Men 2099#33 (fb)) <7 months before the main story> - Gideon awoke from his Revival Chamber tube via an automatic revivication sequence, noting that no elder was present to mark his rebirth with ceremony and invocation, and that his fellow soldiers lay rotting in their tubes, untransformed. Finding the city above him burned to the ground, the streets littered with skeletons, he realized that he was alone and that the Lawless was responsible. Deciding that the Lord has spared him so he might be an angel of vengeance to carry out judgment upon those who had slaughtered his faithful, the last Foolkiller prepared to take out the Lawless. (X-Men 2099#32 (fb) - BTS) - The Foolkiller slew the Reverend, laser-burning the word "FOOL" into his chest and leaving his body in Reno. 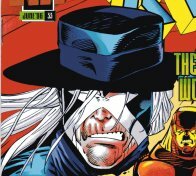 (X-Men 2099#32 (fb)) - Just after Broken Haiku had reported the Reverend's death to Victor Ten Eagles, Foolkiller appeared in Victor's Sante Fe ranch workshop and blasted Victor's right arm off; the laser cauterized the wound, preventing Victor from bleeding out. While the Foolkiller ranted about "long overdue judgment," Victor shut down the shop's lights, lipped outside, blew up some fuel-filled storage tanks, and used a desert-rover's autopilot to reach a hospital in Flagstaff. (X-Men 2099#32 (fb) - BTS) - Foolkiller destroyed Broken Haiku's datadrop, slaying her agent Ulysses Reynaldo Colosia and leaving Broken Haiku offline. (X-Men 2099#32) - Foolkiller confronted and slew the mutant bubble-maker Remo, proclaiming him a fool after he had departed Halo City's Negative Zone bar following a failed attempt to pick up either Twilight or December. (X-Men 2099#32 (fb) - BTS) - Foolkiller wrote "FOOL" in blood over Remo's body. (X-Men 2099#32) - Foolkiller arrived Halo City's Industrial Zone, meeting with Unicelco's Dr. Philo Sungren who explained how man's future depended on their work in waste management. When Foolkiller told him man's only hope lay in repenting his churlish and childish ways, and Sungren noted he wasn't particularly religious. Noting that was a foolish thing to say, Foolkiller presumably slew him. With the Reverend dead, Haiku offline, and Junkpile MIA, the remaining Lawless -- Auntie Maime, Mongrel, Victor Ten Eagles, Xi'an Chi Xan -- met and made plans to draw out the Foolkiller so they could get their vengeance, rather than risking him picking them off one by one. Xi'an acted as bait while the others watched from on high, but when they were distracted by a man who came to Xi'an for healing, Foolkiller ambushed Mongrel, wrapped him in a chain, and began dragging him behind his own aeroglide. Xi'an tried to free Mongrel, but Foolkiller shifted into turbo, his exhaust badly burning Mongrel, and took off. (X-Men 2099#33) - Keeping Mongrel alive as bait at Unicelco, Foolkiller revealed his origins, and the Lawless soon arrived. As Xi'an destroyed the chains binding Mongrel, Foolkiller shrugged off an energy blast from Ten Eagles and then blasted him off his cycle. Before he could strike again, Auntie Maim smashed Foolkiller with her hammer, Josephine, but she paused to gloat over his body, and his next blast shattered Josephine and stunned Maim. Foolkiller denounced Maim's Thorite religion as blasphemy and prepared to send her to Hell, but Xi'an kicked him away and then disintegrated his clawed gauntlet. Foolkiller nonetheless punched Xi'an away and denounced his sins, but Xi'an elaborated on the true/full interaction between the Lawless and the people of New Hope. Foolkiller nonetheless raised his weapon to execute Xi'an put his arm was pinned to the wall by a series of bolts fired by Krystalin who had come to aid Victor Ten Eagles. Tearing his arm free, Foolkiller revealed that he had a omnium bomb built into his own chest and that he would kill the Lawless even if it meant his own death. Xi'an -- having been their leader -- took responsibility for the Lawless' actions and tried to convince Foolkiller to let the others go. Foolkiller refused to negotiate, and Skullfire summoned alongside la Lunatica as back-up by Krystalin, jump-started one of the sky cycles, allowing Lunatica to use the distraction to tackle Foolkiller and break his left arm. She then used her psychic powers to make him relive his own psychic torment. 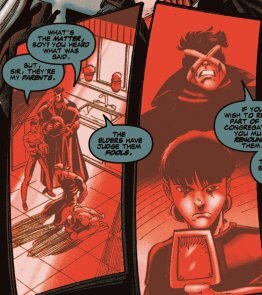 Xi'an sent everyone else out, then approached the stunned Foolkiller, asking him to turn away from the violent life the elders of New Hope had given him. Impressed that Xi'an was risking his life to offer him a chance at redemption, Foolkiller nonetheless decided that to believe that destiny was not preordained would mean acknowledging that his life as a Foolkiller was a horrible mistake; and if that was true, he himself would be the biggest fool of all. He detonated the bomb. 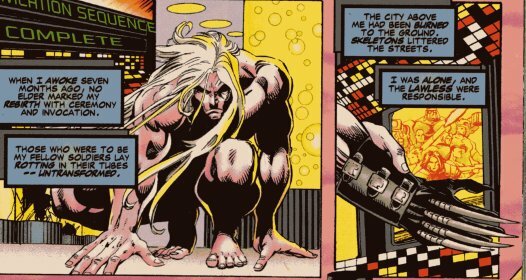 (X-Men 2099#34) - Combing the ruins of Unicelco to see if Foolkiller might have survived, Xi'an and Victor found his skull, his flesh having been consumed by the facility's industrial solvents. Comments: Created by John Francis Moore, Jan Duursema, and Scott Koblish. 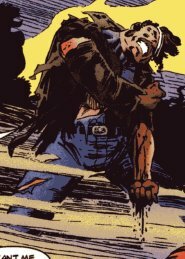 Foolkiller demonstrated the ability to withstand explosions before, so he might have withstood the omnium bomb and faked his death. Then again, not too much going on with the mainstream 2099 reality these days. Xi'an described the Foolkillers as super soldiers, but it is unconfirmed whether they have any connection to the Super Soldiers of the 20th and 21st century of Earth-616. (X-Men 2099#33 (fb) - BTS) - According to Gideon the Foolkiller, New Hope, Texas was "the last bastion of true Americans that still believed in God and family...Good folk free of the taint of the Godless Mega-Corporation Cabal." (X-Men 2099#32 (fb) - BTS / X-Men 2099#33 (fb)) - They fought their way through the "handful of psychopaths called Foolkillers"and then found then rest of the town was willing to fight to the last man to stop them. 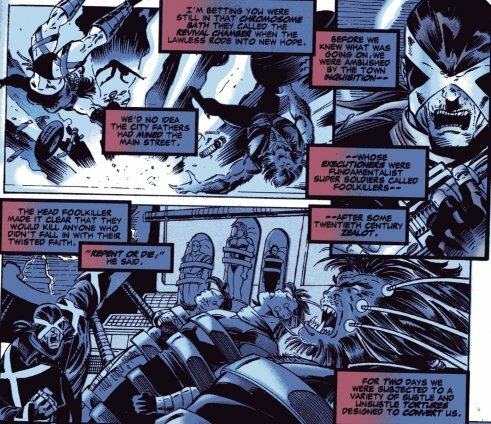 (X-Men 2099#32 (fb)) - When an injured Beaumont confronted the Lawless, telling them "all of the good righteous people of this town are dead -- all because of you --", Junkpile asked Xi'an if he wanted him to kill Beaumont. Noting that Beaumont couldn't stop them from leaving, Xi'an told him not to bother. Beaumont raised his gun, telling Xi'an he knew his kind, and that they thought they could escape their judgment, but "whether it by my hand of another's, you'll all die as fools." Noting he would dance while Beaumont rotted, Xi'an struck him and reminded him that they hadn't asked for any of this grief; the people of New Hope had started it, and the Lawless finished it. As Xi'an angrily kicked the fallen Beaumont, Broken Haiku, Mongrel, and Reverend advised him that there was no point as Beaumont couldn't fight back (and was possibly dead?). Xi'an agreed that they had wasted enough time there and it was time to get out. Beaumont was one of the town elders and not one of the Foolkillers.